American Express will give you a 25% bonus when you transfer AMEX Membership Rewards points to Virgin Atlantic. I’ll show you how to get the bonus points! You’ll earn 25% more Virgin Atlantic miles when you transfer your American Express Membership Rewards points. This deal ends April 30, 2015. 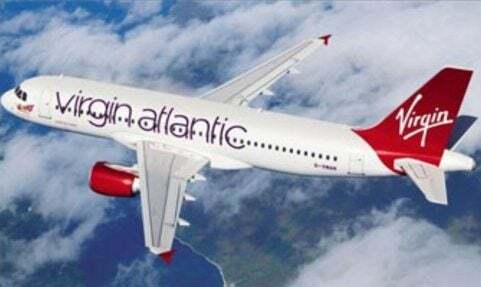 Note: Once you transfer your points to Virgin Atlantic you can NOT get them back! American Express offers transfer bonuses frequently and there was previously a 35% bonus and a 30% bonus. So better deals are likely to come around! Additionally, Virgin Atlantic charges high fuel surcharges. So you typically won’t get a great value with Virgin Atlantic award flights. 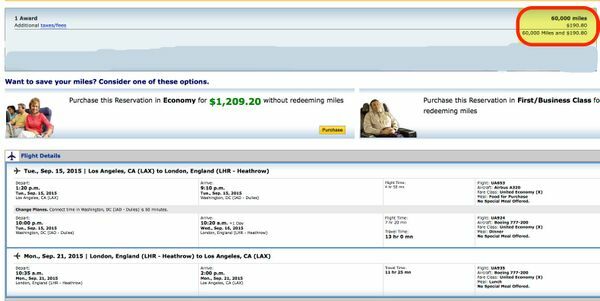 For example, a round-trip coach flight from Los Angeles to London can cost you ~$449 in fees! 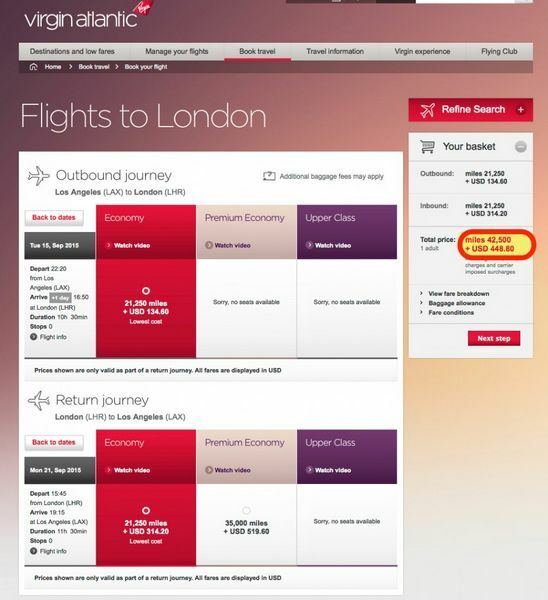 A Round-Trip Virgin Atlantic Flight to London Will Cost 42,500 Miles and a LOT of Fees! On United Airlines you’ll pay 60,000 miles and ~$191. I prefer to use more miles so I have more cash for things like dining and entertainment when we reach our destination! That said, paying ~$449 in fees is still much better than paying full price for a flight from Los Angeles to London, which could cost ~$1,500! 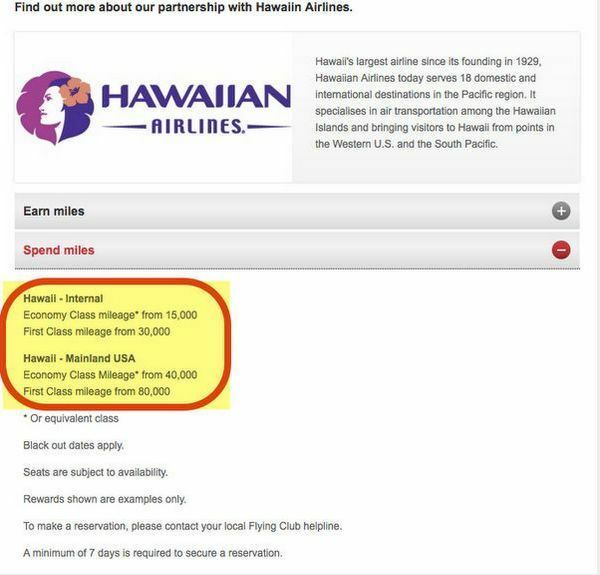 You can avoid paying these fuel surcharges by using your miles on Hawaiian Airlines. If you transfer 32,000 American Express Membership Rewards points, you’ll get 40,000 Virgin Atlantic miles after the 25% bonus. That’s enough for a round-trip flight between the US mainland and Hawaii. You Can Get to Hawaii With Virgin Atlantic Miles and Skip The Fees! The same trip on United Airlines costs 45,000 miles (no fuel surcharges). So you will save miles by using Virgin Atlantic. However, if you’re on the West Coast, it will only cost 25,000 British Airways Avios points to fly to Hawaii round-trip on American Airlines or Alaska Airlines. And you can transfer your AMEX Membership Rewards points to British Airways instead of Virgin Atlantic, which will save you points! You can also use your Virgin Atlantic miles by transferring them to Hilton. For every Virgin Atlantic mile you transfer, you get 1.5 Hilton points. Let’s say you have 50,000 AMEX Membership Rewards points. If you transfer them to Virgin Atlantic, you’ll get ~62,500 miles with the 25% bonus. 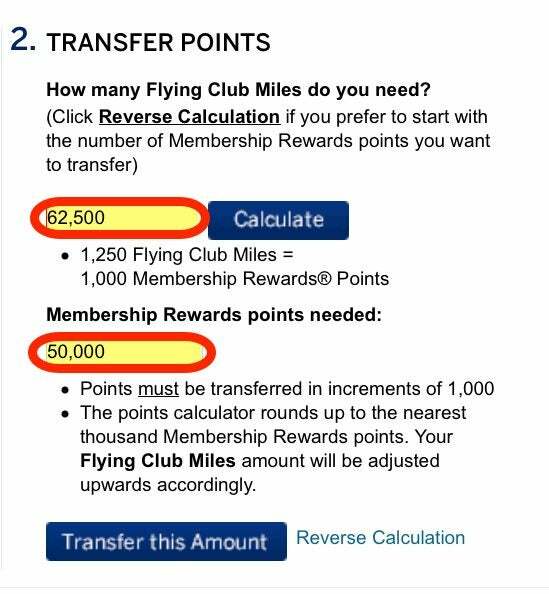 If You Transfer 50,000 AMEX Membership Rewards Points, the 25% Bonus Will Give You Another 12,500 Virgin Atlantic Miles! You can then transfer 60,000 of your Virgin Atlantic miles to Hilton and you’ll have 90,000 Hilton points! That’s more than enough for 1 free night in some of the top (category 10) Hilton hotels such as the Waldorf Astoria Resort in Grand Wailea, Hawaii. To transfer Virgin Atlantic miles to Hilton you have to call Virgin Atlantic at 800-365-9500. And keep in mind, it can take up to 30 days for the points to transfer, but in my experience it takes ~15 days. However, there are plenty of other ways to earn Hilton points. You can currently earn a 25% bonus when you transfer AMEX Membership Rewards points to Virgin Atlantic. This deal is good through April 30, 2015. However, you’ll pay high fuel surcharges on Virgin Atlantic award flights. And while you can transfer Virgin Atlantic miles to Hilton at a 1:1.5 ratio, there are many other ways to earn Hilton points. Plus, American Express has previously offered a 35% bonus for transfers to Virgin Atlantic. So there will likely be better transfer bonuses in the future! And many folks prefer to save their AMEX Membership Rewards points to transfer to British Airways when there’s a bonus. Because they can use British Airways Avios points for cheap short distance award flights. But if you have a specific redemption in mind, like a trip to Hawaii, this may be a good deal. How do you like to use your AMEX Membership Rewards points?